Ramada Rochelle Park Near Paramus hotel has everything that any traveler, corporate or leisure could ask for. Located 30 minutes from New York City - ever exciting, fast paced and electric while you are here you can enjoy Broadway Theater, dining and sightseeing in the city that never sleeps. Getting there is no problem either, directly in the front of Ramada Rochelle Park hotel Near Paramus you can pick up the bus to New York City. 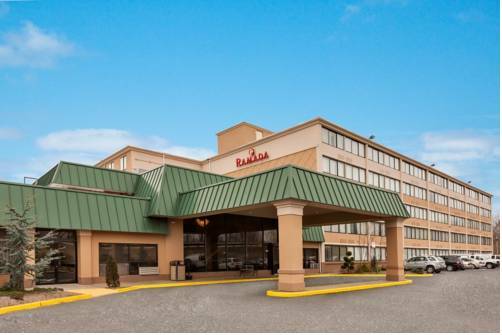 Ramada Rochelle Park Near Paramus is also located 20 minutes from Newark Liberty International Airport, and conveniently located to JFK International and LaGuardia Airports. If shopping is your pleasure you will find yourself in the center of the shopping capital of the tri-state area. Just steps away from Garden State Plaza, the 5th Largest Mall, and minutes from the Famous Secaucus Outlets, to name a few. The Meadowlands Sports Complex including the Meadowlands Racetrack and Continental Airlines Arena are just 15 minutes from this Rochelle Park Near Paramus hotel. The racetrack plays host each year to renowned Hamiltonian Horse Race, the arena is the Mecca of all major concert tours, and here you will find the home of the NY Giants, NY Jets, NJ Devils and NJ Nets. Great sports are always in season at The Meadowlands. Whether visiting on business or leisure, our newly-renovated hotel offers modern amenities like a microwave, refrigerator and laundry facilities for your utmost comfort. Enjoy and work up a sweat with a workout in our fitness center. Enjoy a refreshing beverage at our on-site restaurant/bar open 7 days a week from noon-11pm for lunch and dinner, start each day with free continental breakfast, and go online using free Wi-Fi Internet from your room. Ramada Rochelle Park Near Paramus also offers public computer access in the lobby. Meeting space is also available at our Rochelle Park Near Paramus hotel. ~9 miles from Rochelle Park. ~10 miles from Rochelle Park. ~11 miles from Rochelle Park. ~13 miles from Rochelle Park.